If you have enabled HTML5 in Genesis Framework 2.0 then it uses default WordPress Comment form. The comment_form function takes in two parameters by default. $args: An array of arguments for controlling the output of the comment form. $post_id: The ID of the post for which to show a comment form. This defaults to the current post, so you don’t need it in most scenarios. The $args variable is what we want to focus on. There are two ways to change this. The first is to manually input the arguments into the comment_form() function. The second is to filter the output (see “Filtering the comment form defaults” below). Sometimes you would like to drastically change parts of the comment form. How might you go about changing parts of the comment form while still using best practice with the comment_form(); method? Well. 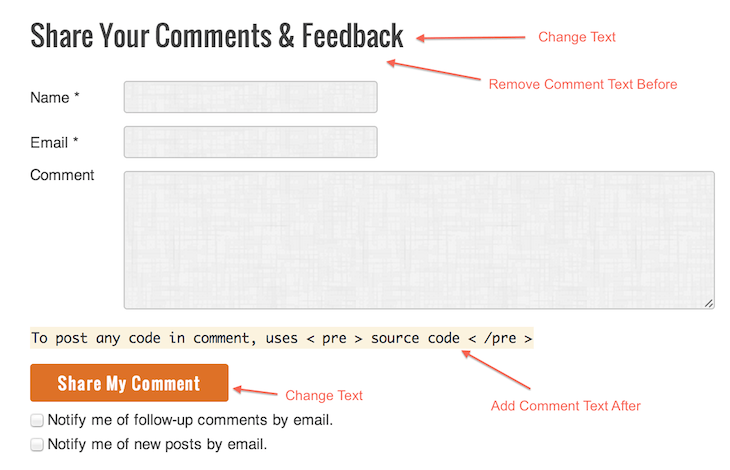 Below simple trick will help you change your comment_form() completely. Just put below into your child theme’s functions.php file and you should be all set. Want to check another way to customize WordPress Comment Form, then kindly take a look at below tutorial. Let me know for any query. What a nice post, In this post I want to know that how to customize default comment form in genesis. Goodmorning! Following his guidance, I Inserted this code to add a checkbox to the Policy before the Send button. the box IS added, but the comment should not be added if the check box do not selected. How do I do this? Thank you!! You are welcome Scott. Happy to help and Happy blogging.